Place all the ingredients (except cherry tomatoes and noodles) in a large soup pot. Season generously with salt and black pepper. Cover and bring to a boil, then reduce heat to low simmer for one hour. Turn off the heat, remove chicken from the pot to cool. Remove chicken meat (no skin) from the carcass leaving it in large chunks and return to the pot. Add cherry tomatoes. Bring a large pot of water to a rolling boil. Salt generously. Add noodles and cook until al dente (about 8 minutes). Drain and keep warm. Just before serving, heat soup until it's hot. 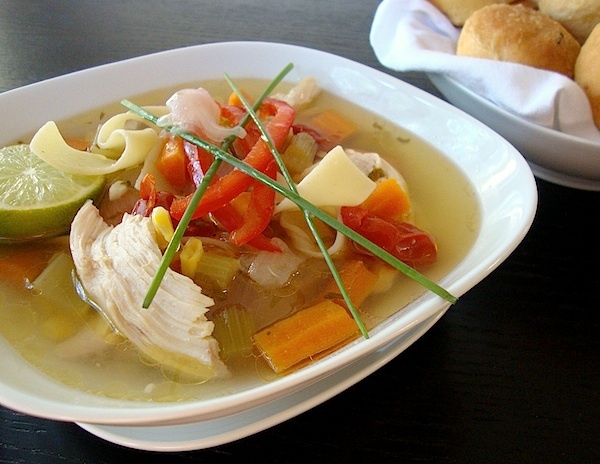 In a large soup bowl, add noodles to the bottom and fill with soup. Garnish with fresh parsley and lemon wedges on the side. I love chicken and I'm alwaya looking for new ways to cook it..